Onkyo TX-NR808 review | What Hi-Fi? Previous Onkyo amps were like bouncers: big and brutish,with a gruff, uncompromising exterior. But, 2010's range has so far revealed a fair few surprises, with the most spectacular being a new flavour of sound: it's spent less time power-lifting and more time in yoga class. This flexibility and finesse worked for last month's Group Test winner, the £500 TX-SR608, but what happens when you step up to the TX-NR808? Simple: sound quality goes up a notch, too. The 'NR808 displays power and subtlety in equal measure – and to fantastic effect. As the American F-16s swoop down to drop their payload on the Decepticons during the final chapters of Transformers: Revenge Of the Fallen, each explosion has weight and power but the amp doesn't sacrifice anything when it comes to control. Detail levels are superb: when Optimus Prime and Megatron battle it out in the forest, although there's plenty of metal scraping against metal, there isn't even a tiny hint of hardness in the treble. Dialogue sounds clear and doesn't struggle to be heard over the volatile soundtrack, and surround effects are handled confidently: there's a wonderful openness to the sound yet the effects steering is accurate and focused. The amp introduces drama and tension when it's required and it can switch into an all-out attack on your senses at the drop of a hat. That even-handed approach helps with CD playback, too. Eminem's Without Me sounds punchy, rhythmic and well-defined. Switch to something less frantic, such as Florence And The Machine's Daniel and the Onkyo gets to show off a more delicate, subtle side. This versatility is a great trait to have. And talking of versatility, a special mention should go to the 'NR808's networking functionality. Not only is it DLNA certified, it can also stream music using Napster and last.fm. Log in using the latter and you can search for artists, see the most popular picks and recap on what you last listened to – complete with album art. It's a neat, thoughtful feature that works well in practice, despite the occasionally sluggish response to remote commands. Those of you wanting to upconvert and upscale lower-resolution pictures won't be disappointed. The THX-certified 'NR808 produces some of the most stable and crisp images here. You can alter aspects of picture quality, such as noise reduction, hue and contrast, but we achieved the best results with minimal tweaking. As with the Denon AVR-2311, the 'NR808 also features an iPod/iPhone compatible USB input but comes equipped with seven HDMI v1.4a inputs and twin outputs. 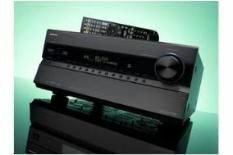 Dolby Pro-Logic IIz and Audyssey DSX technology both give you the option of front height channels but the latter also adds the possibility of adding two front width speakers. OK, so it might not be the prettiest of machines, but who cares when home cinema sounds as good as this?